Stand up for the United States of America. 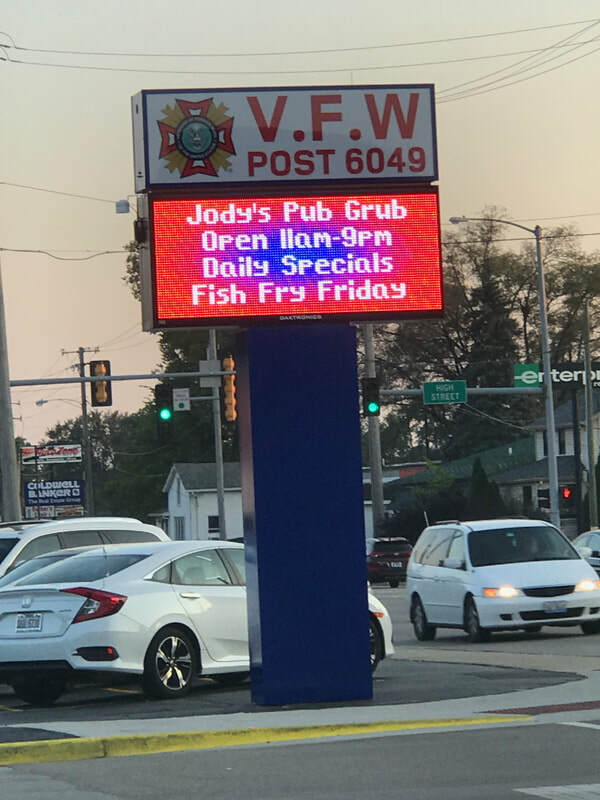 Every member of the VFW has. Be a patriot, they are. The Post has a number of glass topped display tables in the Club Room. We have placed the shields of Air Force, Army, Coast Guard, Marine Corps, and Navy in some of them. We welcome donations of small items of US military memorabilia for all of the services to be displayed in the display table cases from World War I to the present. Examples of these items are photos, unit/ship patches, medals, and other uniform decorations and items. ​The Post Club Room is open 1200 daily. 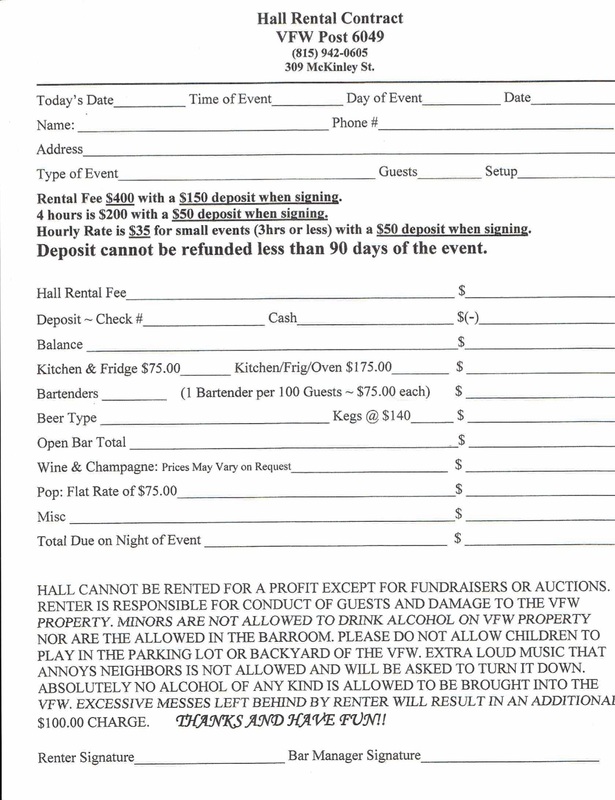 Bring your items in a bag and leave with the bartender for the attention of the Post Commander or Quartermaster. Please leave a note in the bag with your name, address, and phone number, so the Post can acknowledge your donation. Prior to the Post meeting this date. 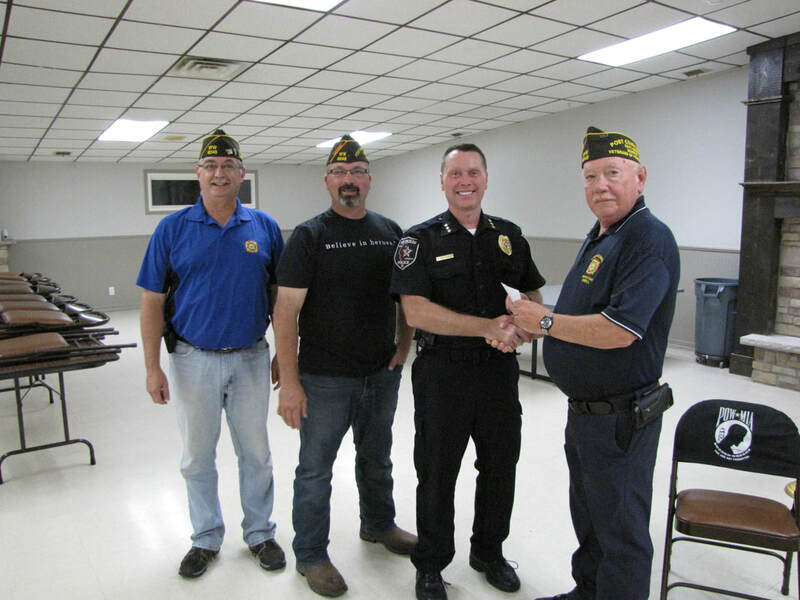 VFW Post Commander, Gerald Zeborowski, Senior Vice-Commander, Kenneth Buck and Post Quartermaster, Jerry Peterson presented a check for $2,000 to Morris Police Chief, John Severson. This check will go toward the purchase of an Automatic External Defibulator machine. The City of Morris hopes to obtain funding for at least six of these AEDs. They will be placed in businesses in Morris and their locations will be made know to all other nearby businesses. They will help to save lives when the need arises prior to the arrival of professional first responders. 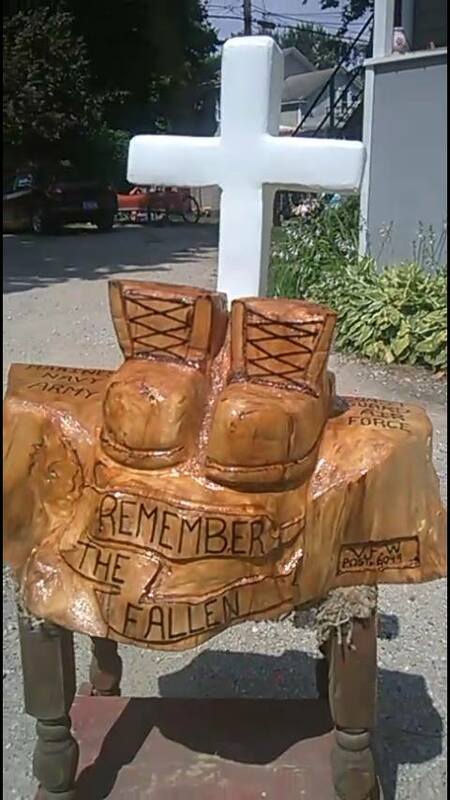 The Morris VFW thanks Ken Heck and his son for the donation of the"REMEMBER THE FALLEN" carving to the Morris VFW Post 6049. 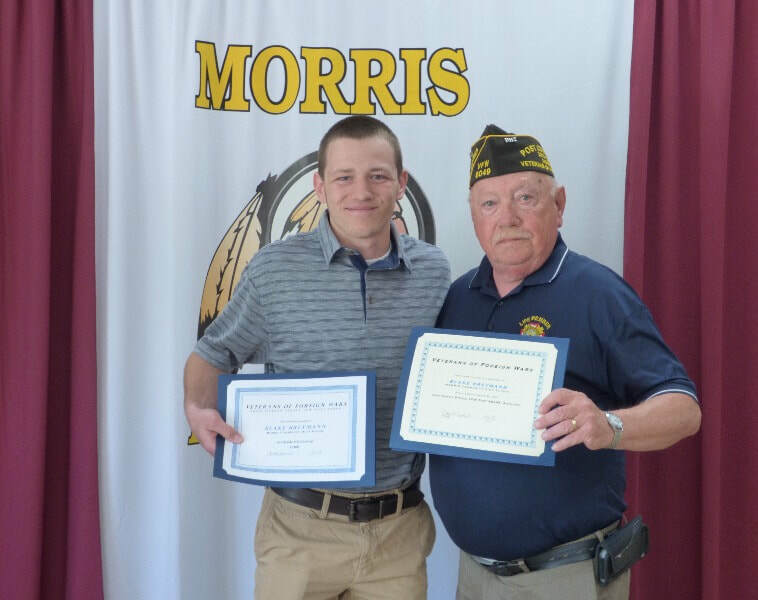 Ken and his son made the presentation while the Morris Color Guard was in attendance. 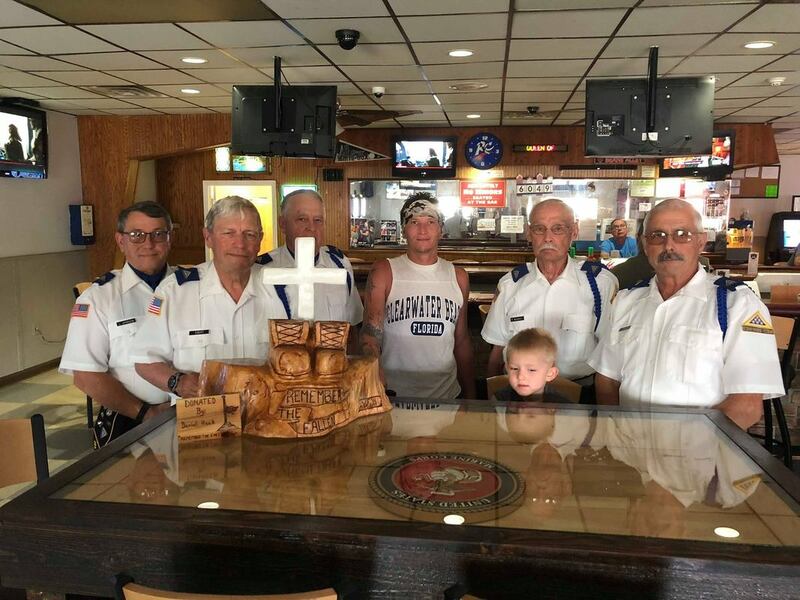 Ken says that, "It was a honor carving this piece and a honor to the gentleman who proudly joined the picture you made my day." It is beautiful piece hand carved by Ken. 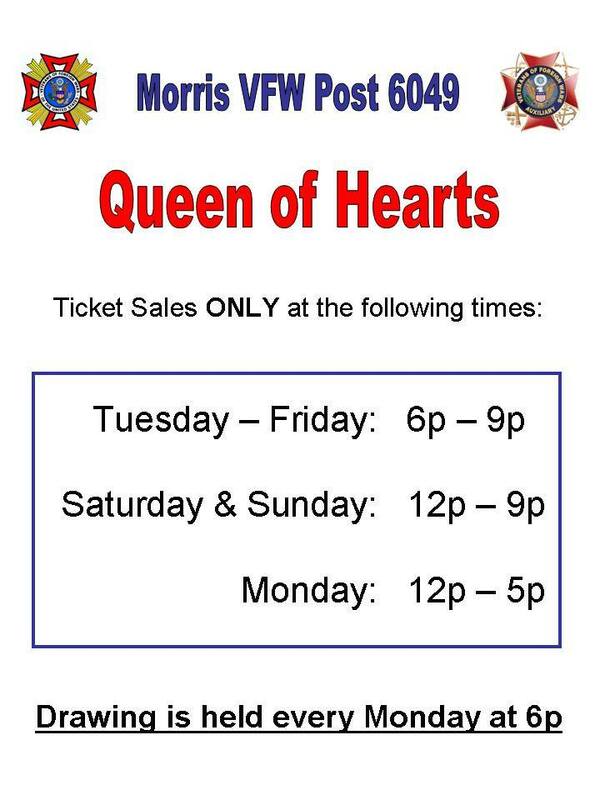 Always refer to Facebook Morris VFW Post 6049 Queen of Hearts for correct information. to Mayor Kopczick, Morris Fire Dept., Morris Police Dept., Grundy Co. Sheriff, Morris Color Guard, American Legion Riders, members of the VFW Post #6049, members of the American Legion Post #294, Disabled American Veterans Post #86, and to all other patriotic citizens who gathered at the 9/11 Memorial, by the Big R store, in the early morning fog, to commemorate the events this day in 2001 when thousands of patriots and innocent perished. 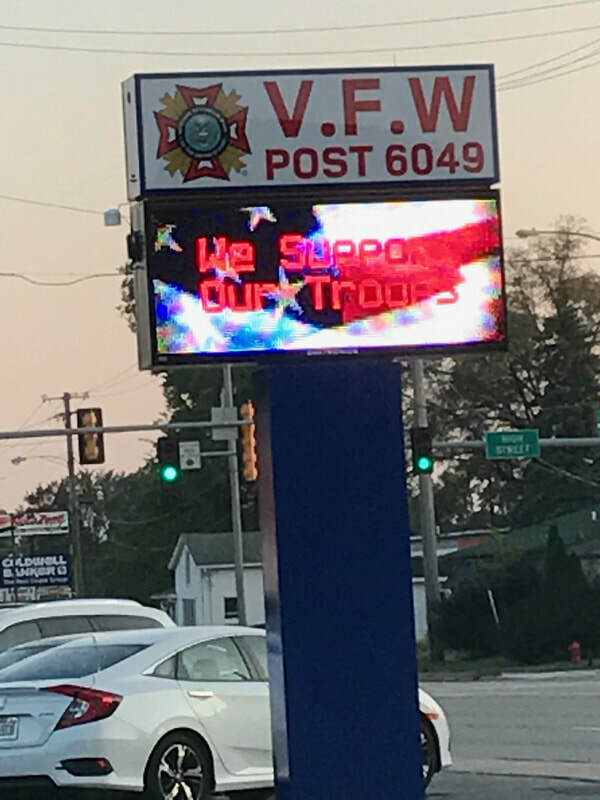 Thanks also to the patriots who sat out in the front of VFW #6049 on Route 47 all day encouraging horn blowing salutes from those who passed by. Thanks also to the patriots who flew the American flag at their home and/or business. $5 a ticket - Need NOT be present to win. 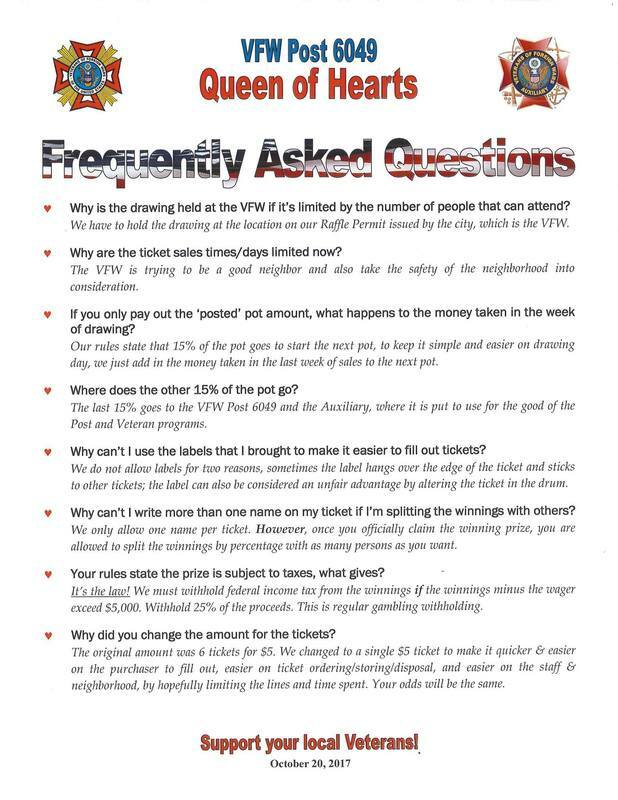 50/50 tickets will ONLY be sold on Monday 12-5:00PM. ​Must be present to win for 50/50. Please see rules at the hall. Tickets are sold at the hall only and may not be taken out. Tickets must be completed on site and turned into the barrel. Tickets may not be folded, crunched, or in way manipulated. 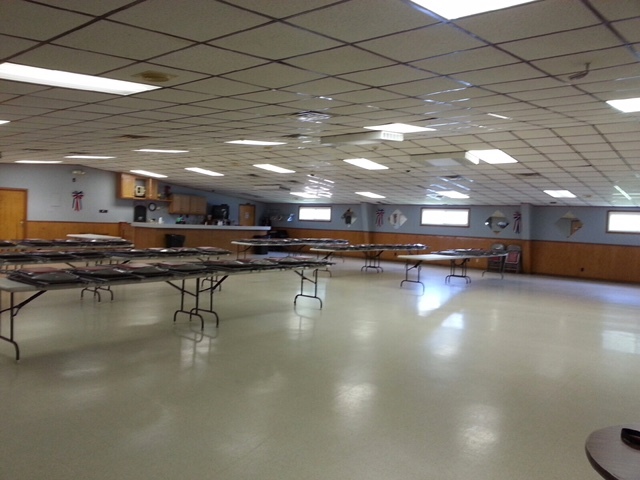 We appreciate all the hard work by the VFW Auxiliary, the staff, and bar manager, Shanna. 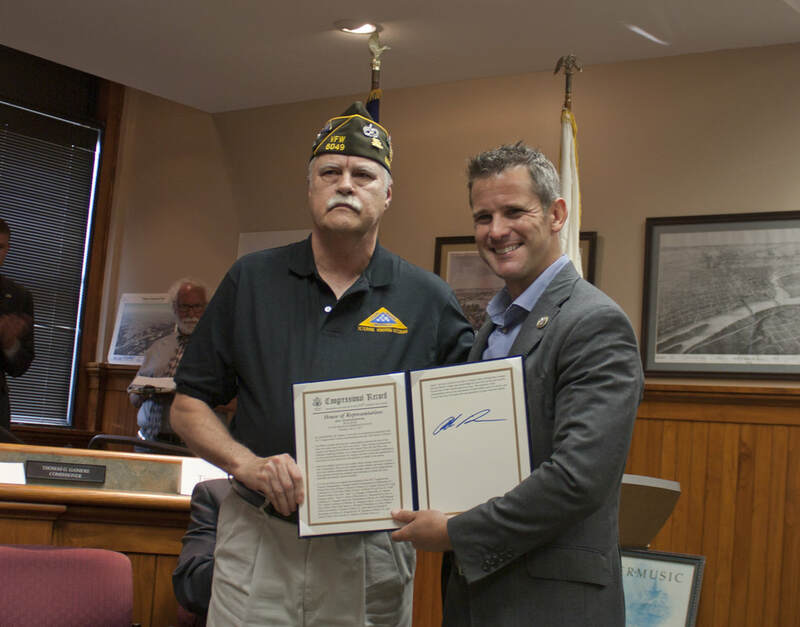 Congratulation to Past Commander Mike Ebert for the Congressional Veterans Commendation presented by Rep. Adam Kinzinger August 7, 2018. 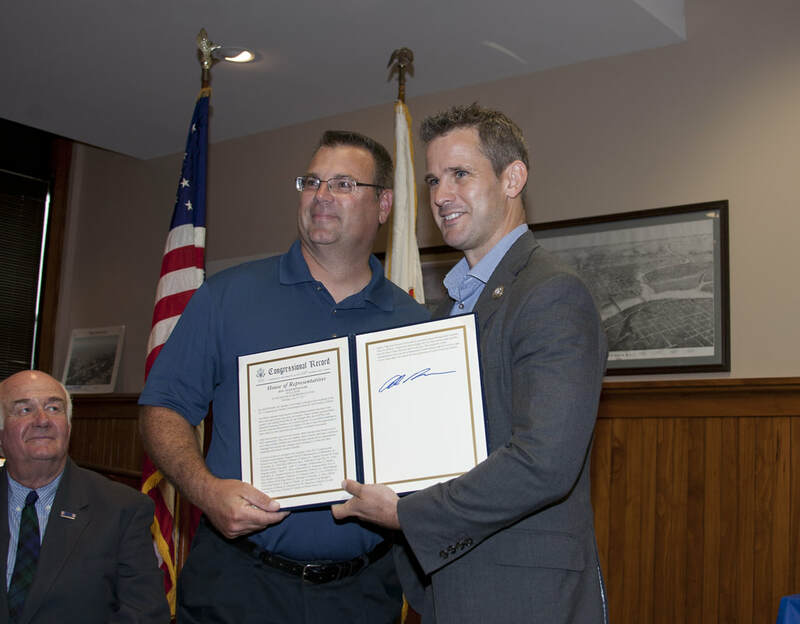 Ebert was one of 6 in Kinzinger's district to receive the award at a ceremony in Ottawa also attended by Sen. Sue Rezin. Ebert served in the Army in Vietnam and Korea. You can pick a date for an event but you really cannot pick the weather. 29 March 2018 was windy, overcast morning with on/off rain showers and the temperature in the 40s, rather nasty. 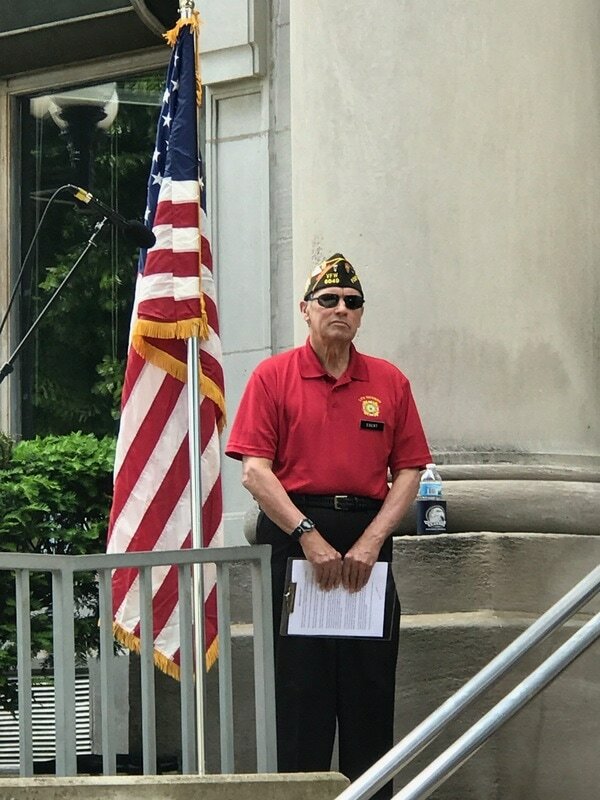 Nevertheless, approximately 200 Vietnam, Vietnam era, other veterans and their friends and loved ones gathered at the Abraham Lincoln National Cemetery’s flag pole assembly area. 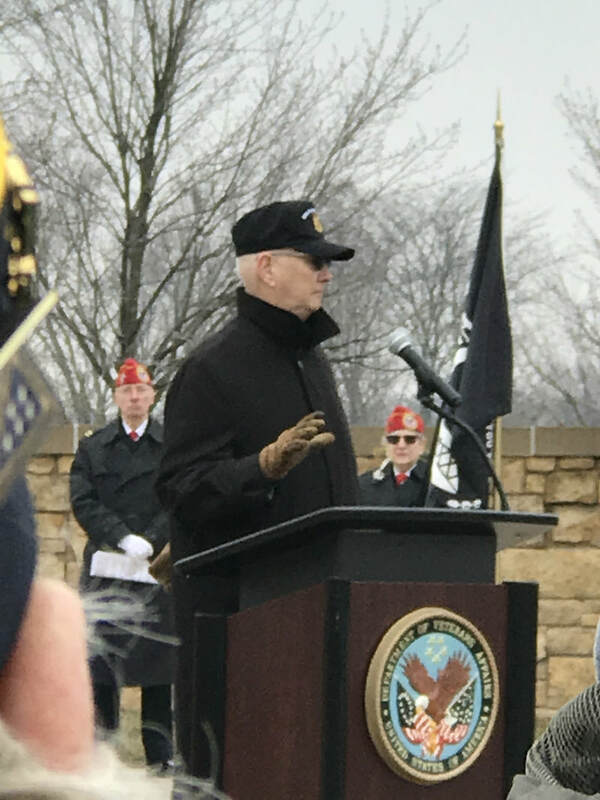 The Abraham Lincoln National Cemetery’s Honor Guard conducted the posting of colors and subsequently the rifle salute and taps for the fallen and departed. 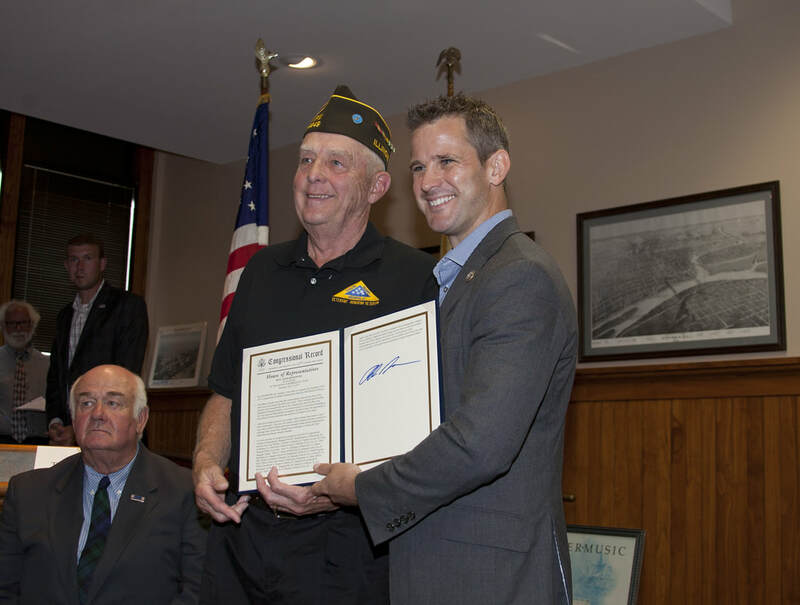 This year’s keynote speaker was Medal of Honor awardee, Mr. Allen J. Lynch of Gurnee, IL. On 15 December 1967, Mr. Lynch, then Specialist 4, infantryman, United States Army, D Company, 1st Bn, 12th Cavalry, 1st Cavalry Division (Airmobile) was involved in an action in the vicinity of the village of My An, Binh Dinh Province, Republic of Vietnam. He observed three wounded comrades exposed to enemy fire. Lynch ran across 50 meters of open ground under enemy fire to render aid to these comrades. Looking for cover, he observed a nearby trench and while reconnoitering it killed two enemy soldiers at point blank range. He then made three round trips to/from where the wounded were located and the trench all the while exposed to enemy fire. Subsequently, his company was forced to withdraw in the face of superior enemy firepower. Lynch chose to remain with the three wounded and defended “his” trench with his rifle and hand grenades for the next two hours against enemy advances. (Many times in Vietnam if the VC/NVA came across wounded Americans on the battlefield, they killed them. Lynch may have known this.). In the process, he killed five more of the enemy. Again disregarding his own safety, under continuing enemy fire, he crossed 70 meters of exposed terrain multiple times to individually move the wounded to a more secure location. Once their comfort and safety had been assured, Lynch then located the counterattacking friendly company to assist in directing their attack and evacuating the three casualties. 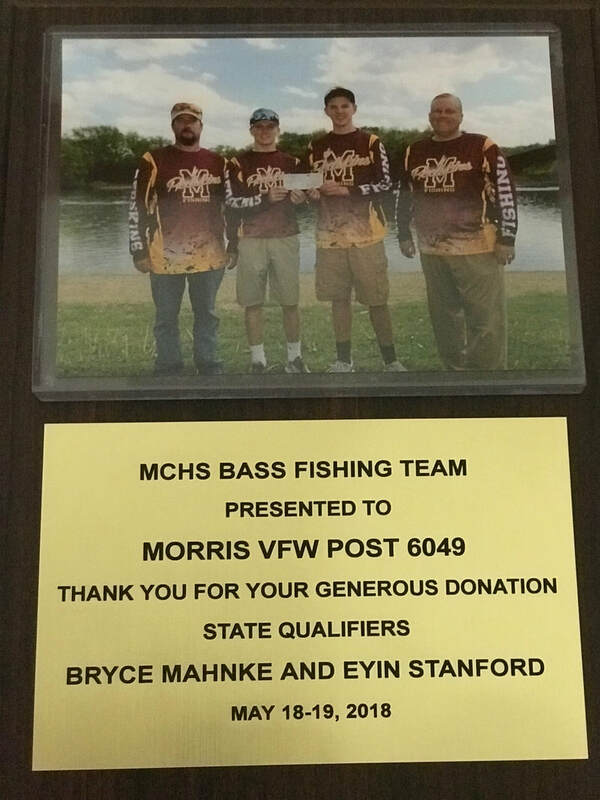 Post 6049 is proud to have been a sponsor of the Morris Community High School, Bass Fishing Team that was involved in the state high school fishing tournament at Lake Carlisle in May 2018. Congratulations to Bryce Mahnke and Eyin Stanford and their coaches, Bryce’s dad Shane and Shawn Hornsby. May you all have many more fishing successes in the future and fond memories of them. We hope you will be lifetime fishermen and pass this great outdoor sport on to those who follow you. Glad we could help you realize this special experience. Fishing can be as simple as a cane pole, a matching length of line, hook, sinker, bobber and a juicy worm to “dress” the hook. In Post 6049 territory, the Illinois state fish, the Bluegill, can be found in abundance in the lakes and waterways. They seem to always be hungry and a “school” can keep a fisherman entertained. The novice angler sees fish activity beyond his/her range. Now you need a rod and reel for casting and to learn how to do that. What is out in the middle of the lake or river? If you can’t cast that far, now you need a boat and to power it oars or an electric or gasoline motor and an anchor to keep you in place if desired. All fish don’t care for worms, but bass do. For others, you’ll need different types of bait or lures. One thing leads to another. No doubt about it, fishing has the most and varied equipment of any sport and this includes boats, trailers and vehicles to tow them with to the fishing sites. Fishing teaches patience and perseverance. Every fishing day will not be a bonanza and there will be frustrations too such as catching your hook or lure in a tree, on a stubborn weed, underwater obstacle and perhaps losing it. If you are dedicated, you will have to put up with annoying insects and the vagaries of the weather too. A lot of good fishing occurs during steady rain, not during thunder and lightning. Very dangerous, stay indoors. In life, if something is worth doing/achieving it is worth the effort required to do it. This photo is the Minooka HS scholarship award recipient. His name is Tim Doody, and he received a $1,000 scholarship from the Post and a second $1,000 scholarship award from the Post Auxiliary. He was selected by two independent scholarship groups. He will be attending Trine University majoring in Chemical Engineering. Ceremony was held on 4/23/18, at the High School. These are the first two scholarships that have been awarded in the Post's 72 year history. ​ This is a photo of the Morris HS scholarship award. His name is Blake Breyman. 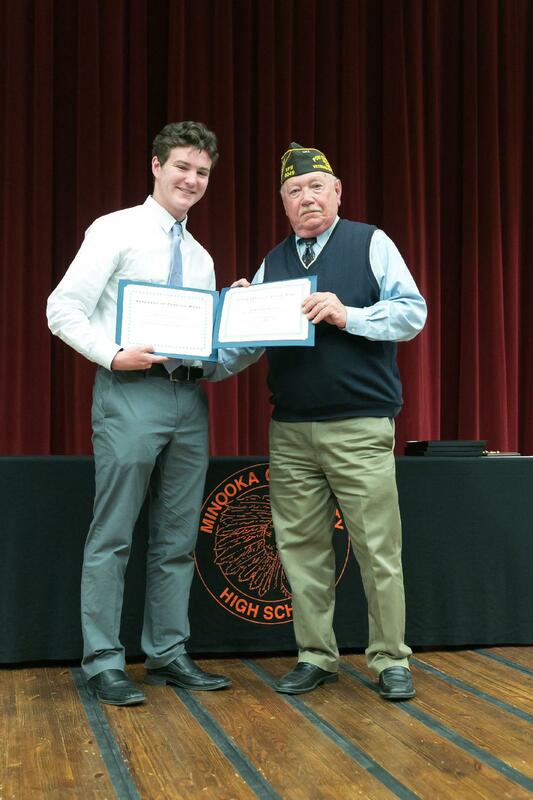 Blake received a $1,000 scholarship award from the Post and a second $1,000 scholarship award from the Post Auxiliary. Blake will be attending Millikan University pursuing a degree in Nursing. Blake was selected from two independent scholarship groups. The award ceremony was held on May 10th at the High School. 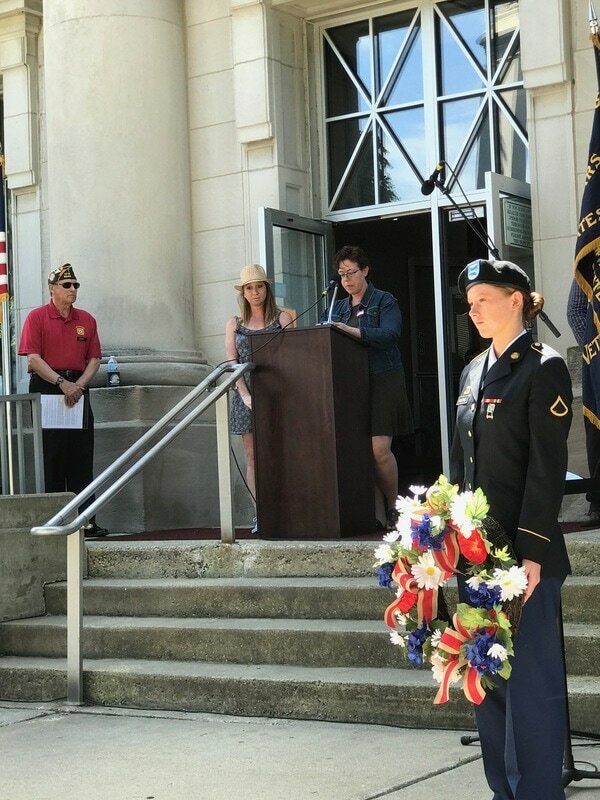 Blake was the Keynote Speaker at the Memorial Day Ceremony. Are You a Veteran, a Patriotic Citizen or Both? One way to express your patriotism is to honor those who have served the United States of American. There has been some form of honor/color guard in Morris since at least 1916. 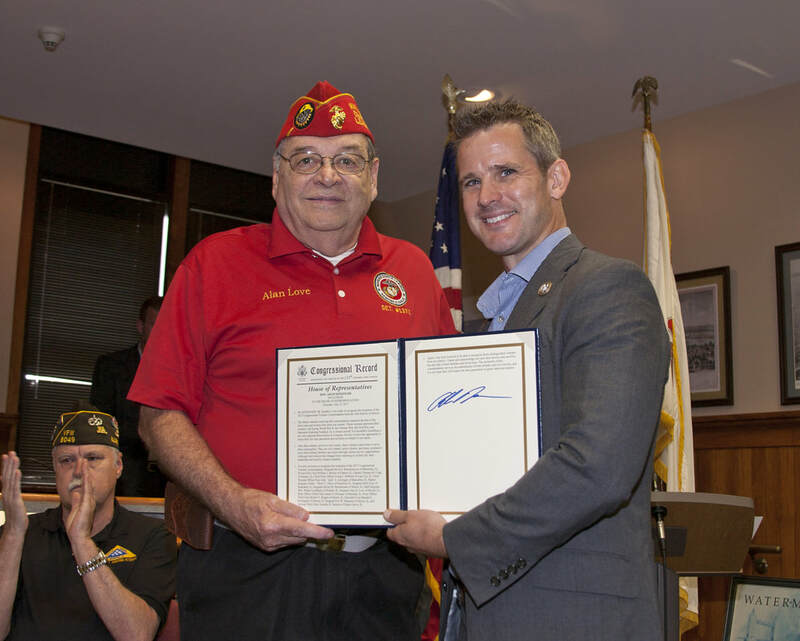 The motto is carried out by the performing military honors at Veteran's funerals; participating in parades and ceremonies on Memorial and Veteran's Days and other civic events as requested, e.g. Grundy County Corn Festival. Qualifications: Veteran funeral services are conducted Monday-Saturday, mornings or afternoons. Please note, the Color Guard is not out there six days a week, but there are times when multiple funerals do occur in the same week. This timing is best suited to men and women who are retired or have flexible work schedule. If you can walk, hold a ten pound ceremonial rifle or an aluminum flag pole and flag, you are physically qualified. The Morris Color Guard is not a drill team, however certain basic and easily learned military drill and ceremony commands and movement are utilized. Fully staffed funeral honors for a veteran requires 11 personnel. Having a sufficient personnel pool insures that this goal can be achieved in a consistent basis. Uniforms: Uniform items for all seasons are furnished. For those items not on hand such a shoes, the member is reimbursed. One exception is that if you are a member of a veterans organization, such as the American Legion or VFW, etc. you will be expected to purchase your own cap. These caps are worn at all events in which the Color Guard participates. Have you noticed the new signs and siding? The property is getting a much needed facelift. 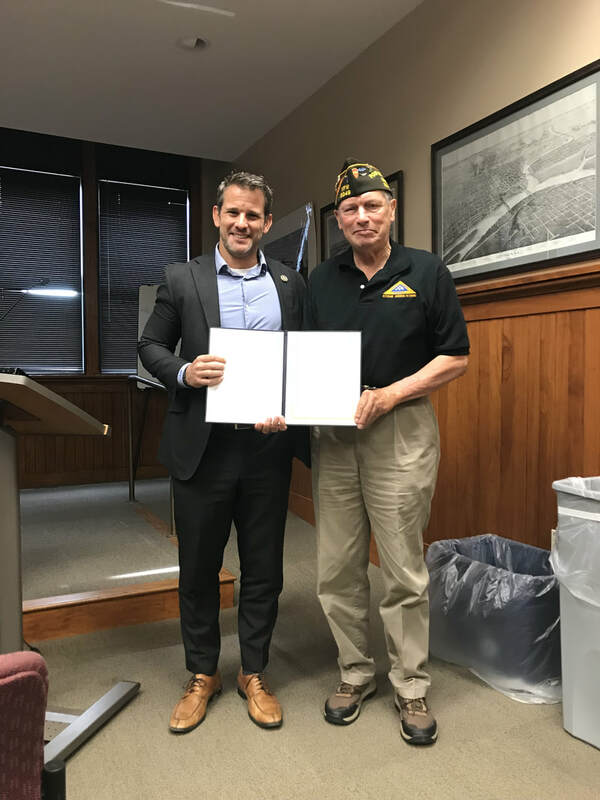 The following Post 6049 members received a United States Congress Congressional Veteran Commendation from Congressman Adam Kinsinger on 3 August 2017 at the City of Ottawa, City Hall Council Chambers, 301 W. Madison St., Ottawa, IL. Steven Huettemann served in the United States Army, Desert Storm Veteran. 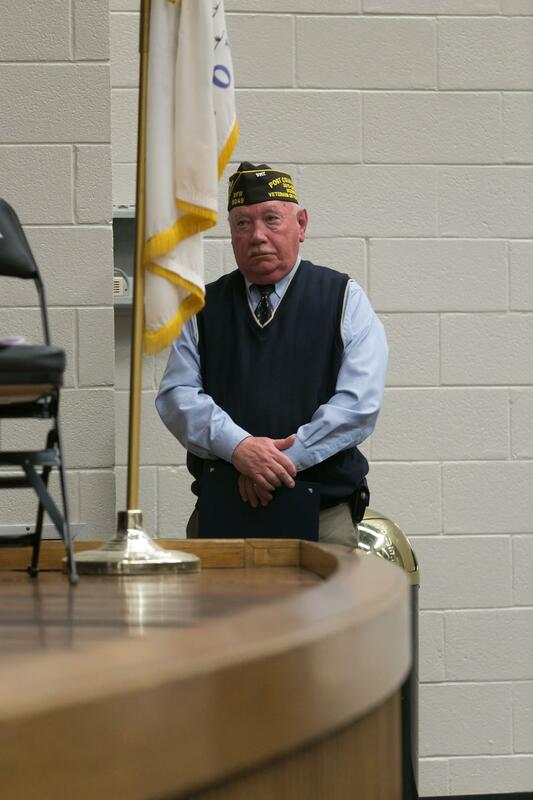 Alan Love served in the United States Marine Corps, Vietnam Veteran. Eric Sampson served in the United States Air Force, serving in or supporting Korea, Bosnia-Herzegovnia and two deployments re Iraq. Congratulations and thank you gentlemen for your service to the nation, the fine examples you have sent, and the contributions you have made to your community through your chosen professions and other interests. 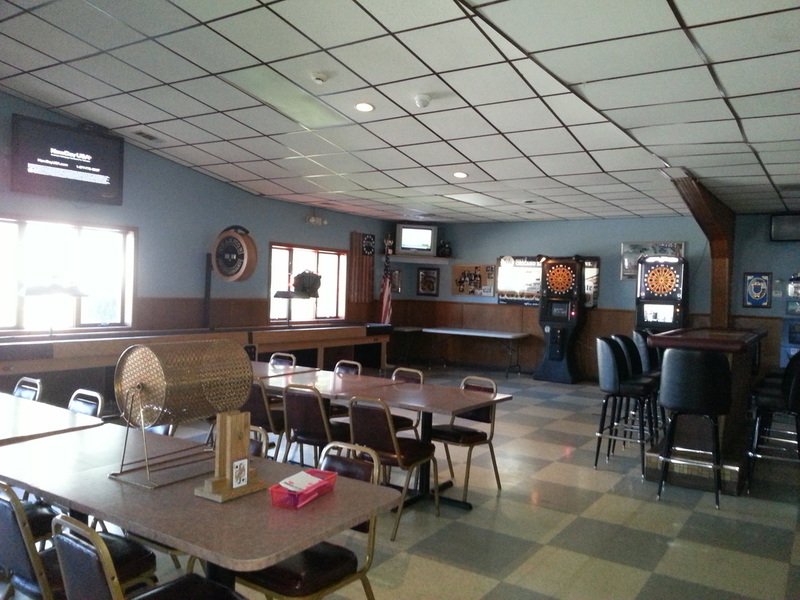 Features a full service bar with access on all sides, a full compliment of large screen sports bar style TVs, pool table, darts, and shuffle board.. There are five video gaming machines on which to test your skill or luck. Want music? We have that too! 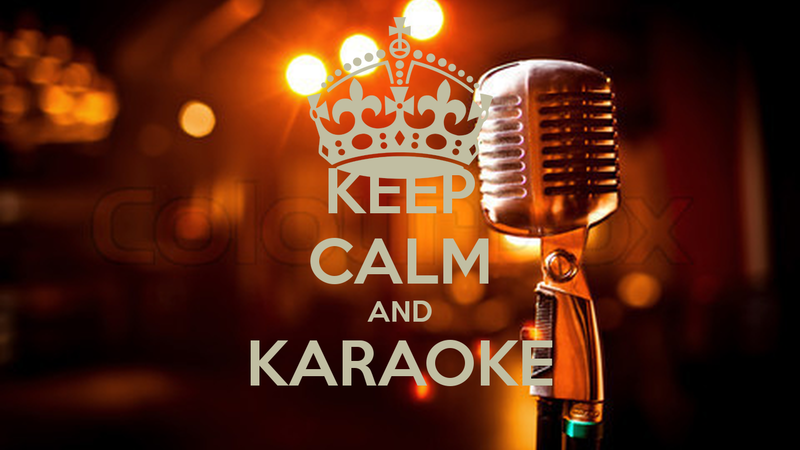 There is KARAOKE every Friday from 8:30PM - 12:30AM. Come on in! Please contact Bar Manager, Shanna. 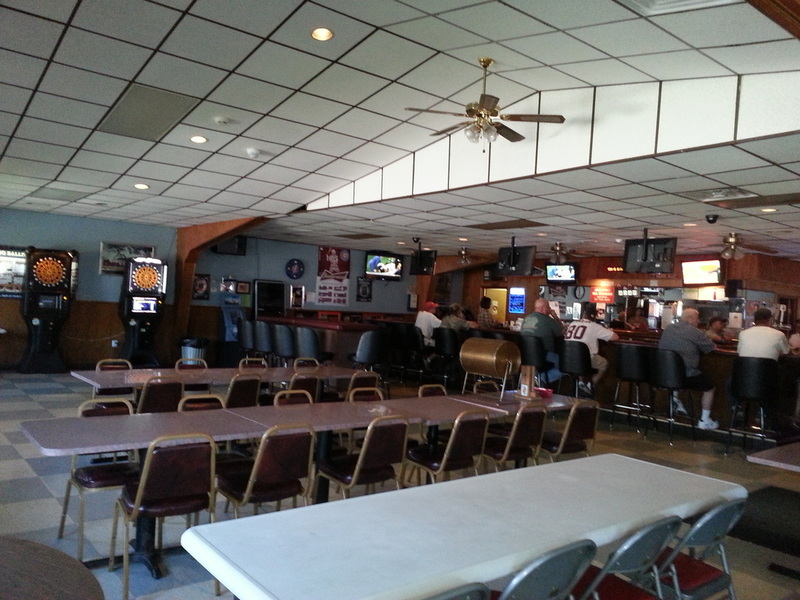 The Hall can accommodate up to 300 guests and it has its own bar. Why pay for chandeliers you can't take home? The most important thing about any event is that you and your guests enjoy the gathering and have a good time. To see a larger copy of the contract or to download and print, please click on this link.